Welcome to CDP Theme Day. At the beginning each month City Daily Photo participants post a photo related to a specific theme. This month's theme is Black and White in color. I took this picture because of the deco era lettering and the period wrought iron lamp. Much to my surprise the color photo looks like a black and white. Follow the link above to see more photos for this Theme Day. This recent mural is done by Peskador, a talented street artist who often changes his style to suit his intention. It graces the right side of a doorway and has a companion piece on the left side of the door. We'll save that for next week. With the steady onslaught of rain, this Girl Mobb mural represents our expectation the sun will eventually return. I love Girl Mobb's comic book style. This gal looks like someone who would fit in an Archie comic. Found on the Oakland/Berkeley line. Welcome to Monday Mural. If you like murals or have a mural you'd like to post, this meme's for you; just follow the Linky steps below. You decide what constitutes a mural. Once you start looking you find them everywhere. Be sure to link back to this blog and visit your fellow posters. Looking forward to your mural finds posted this week. 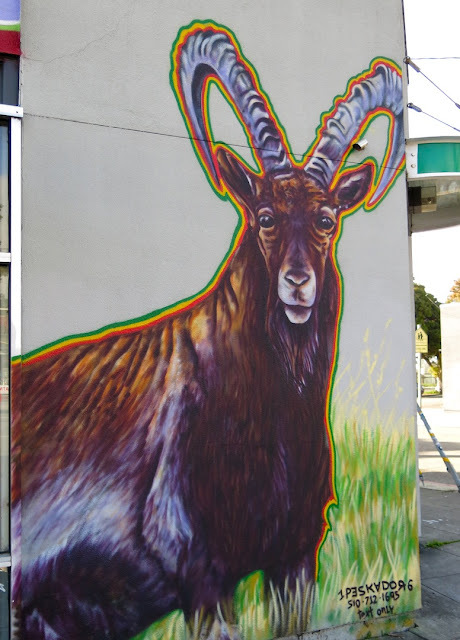 Max Kauffman got the nod to create murals on the downtown PG&E (gas and electricity) substation. He clearly has a wild imagination and to my eye likes to blend species in his compositions. Even his houses look a little anthropomorphic. Bright and entertaining if not a little confusing. Created in 2014-15. 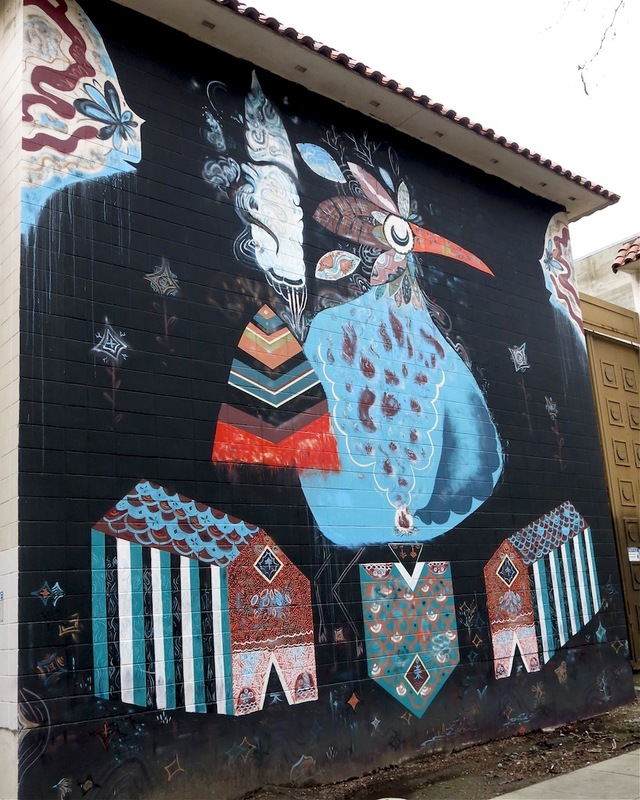 A Jet Martinez mural was recently completed in downtown Oakland at the rear of the iconic I. Magnin Building. I. Magnin was a chic fashion store on Broadway and 20th housed in a fantastic green terracotta tiled Deco building. It now contains offices and still shines among the other Deco buildings that grace downtown. This mural was arranged through Athen B Gallery and made possible through the building owners HP Investors and Lake Merritt/Uptown Association. Did anyone else think of Diego Rivera when they first looked at this?